It’s June! This means lots of watermelon! Okay, before I even talk about this fun, delicious, crunchy, salad with feta cheese ALL over it I have to tell you about this watermelon. Here’s the deal, I started seeing watermelons in the store a few weeks ago, but told myself, “not yet, not yet, it is too early” and it indeed was too early, but about a week and halfish ago I gave in and bought one of those giant suckers. Then, everyone left. Well at least all the watermelon eaters in the house anyway. So there I was little old me, stuck with a giant watermelon. Now trust me, I could totally down that whole thing in one day. Maybe not in one sitting, but definitely in one day. To stop myself from doing this and having a stomach the size of a watermelon my brain started thinking – watermelon recipes? Here’s the truth. While I am learning to like fruit mixed with other foods, watermelon is one of those fruits that for the most part I just want to eat plain. straight up, just watermelon. But, oh yes there is a but. There is almost always a but. But… that does not mean I don’t like it mixed with other foods. Cause I promise you, I do! Did I just confuse the heck out of you guys or what? I guess what I am trying to say it that my very favorite way to eat watermelon is plain, but I will eat it in any form I can get it, and will greatly enjoy! Here is what I really want to tell you about this watermelon though. The day I cut this thing up, it was full on snowing! Yes, snowing. It felt so strange to be cutting a watermelon while it was snowing. I mean, to me watermelon means HOT sunny day’s. Like, hot, hot. I am glad to say that it is no longer snowing and yesterday was an awesome day. Full sunshine and pretty perfect start to June! YES! Now, let’s hope it stays that way cause you never know around here. 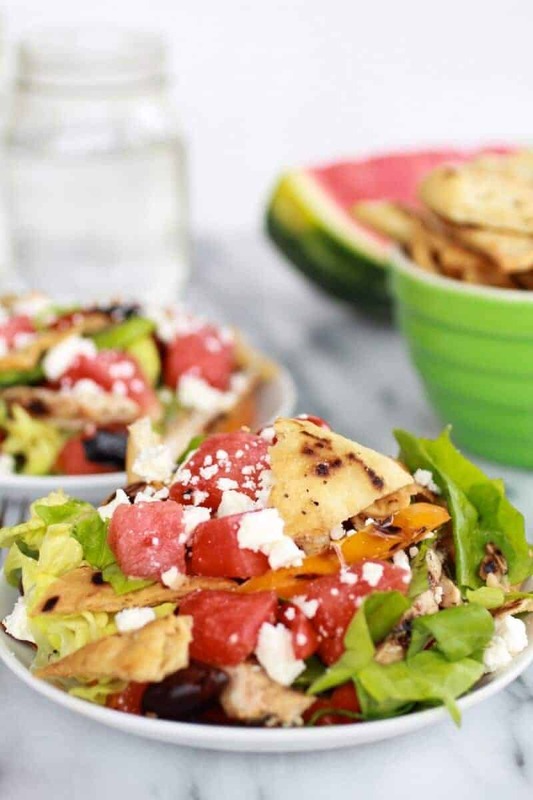 Moving on from the watermelon, let’s talk about these homemade pita chips. Oh yeah, homemade pita chips! They are SO good. Addicting. Crunchy, salty and so crazy easy it is ridiculous. All you need is a few pitas, sea salt, pepper maybe some garlic and olive oil. The just cut them up and bake them for 12 minutes and you are done! Told you, easy peasy lemon squeezy. Now here is what you absolutely have to do with those homemade pitas chips. 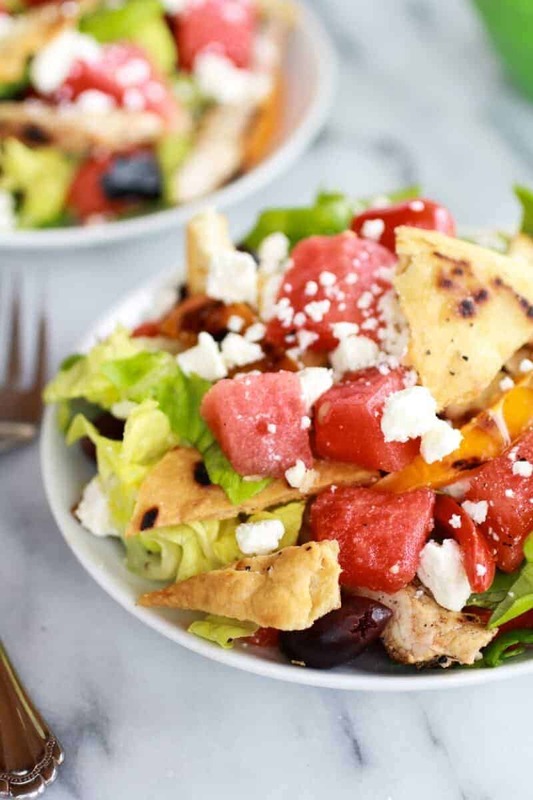 One, make this salad (that by the way is pretty darn good and the perfect warm weather salad) and two, scoop that salad up with the chips. Ah huh, just like you were scooping up salsa or guacamole. Except you’re eating salad! It’s so fun and so good and maybe the only way I ever want to eat salad again. Nah, gotta keep forging those new food frontiers! The flavors of this salad all just work. 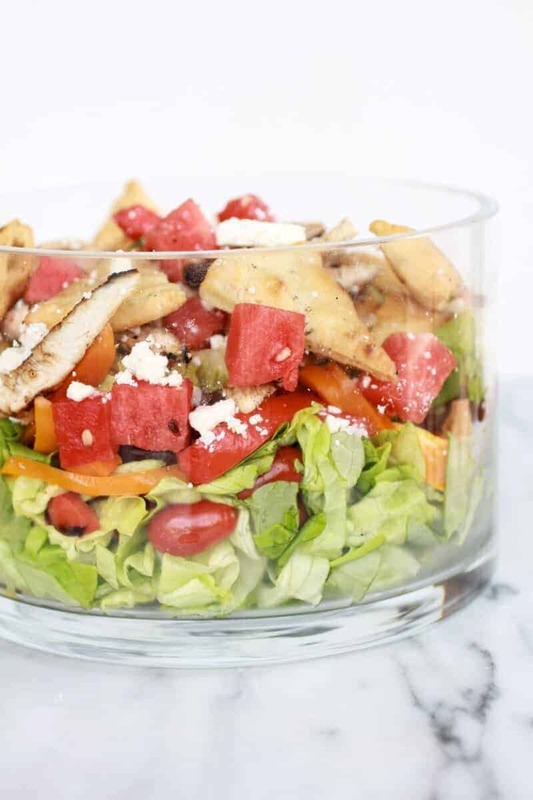 The watermelon, feta and basil with the greek olive and peppers and then throw in the Greek chicken. It’s awesome and it’s crazy healthy, which is good since I can tell you for a fact that Friday I am going to be killing your diets. Sorry in advance, but not really. It’s gonna be worth it. They are SO good. Addicting. Crunchy, salty and so crazy easy it is ridiculous. All you need is a few pitas, sea salt, pepper maybe some garlic and olive oil. In a large salad bowl (the one you want to serve the salad in) add the lemon zest, lemon juice, olive oil, garlic, honey, oregano, basil, crushed red pepper (if using), salt and pepper. Whisk to combine. Remove about 1/4 cup of the dressing and place it in a large ziplock bag or a medium size bowl or baking dish. Add the chicken to the bag, bowl or dish and toss well. Place the chicken in the fridge for 20 minutes or up to overnight. Set the remaining dressing aside. While the chicken marinates make the pita chips. Cut pitas into 8 wedges (or more if your pitas are big). Pour olive oil into a bowl along with the garlic, oregano and paprika. Brush the pita chips with the olive oil and garlic mixture and then sprinkle with fresh sea salt and pepper. 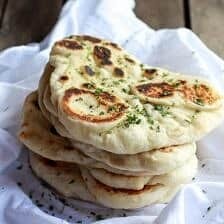 Arrange pita chips on baking sheet and bake for 12 to 15 minutes. Grill the red and orange peppers for about 10 mins or until slightly charred, but still crisp. At the same time grill the chicken for a total of about 10-15 minutes or until the chicken is cooked through. Remove both from the grill and allow to cool 5 minutes. Then thinly slice the chicken and peppers. To the salad bowl with the dressing, add the peppers, tomatoes, olives, red onion and lettuce. 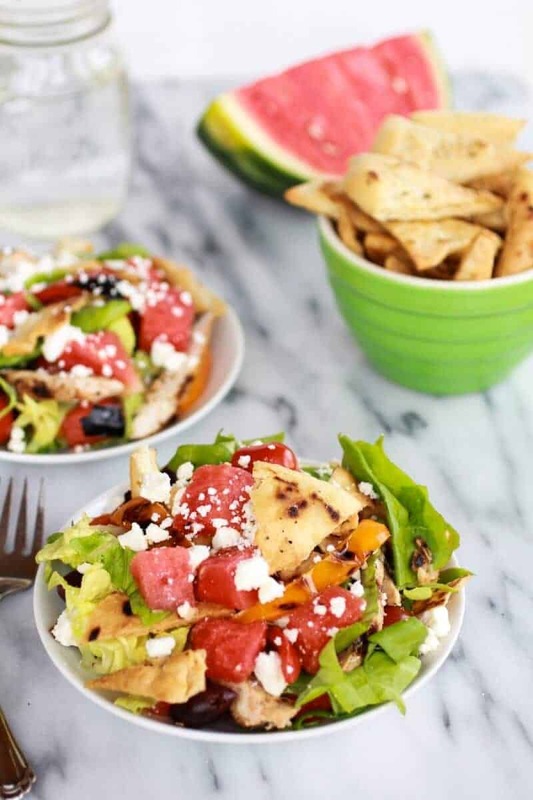 Toss well and top with the chicken, watermelon chunks, feta cheese and pita chips. Eat! I’d say the week’s looking tasty! 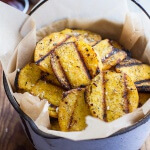 Easy Grilled Parmesan Polenta Chips. 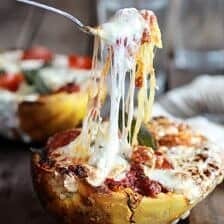 What a gorgeous recipe!!! I could eat this every day for lunch!! Thank you, Liz!! It really is perfect for summer! You take such pretty pictures! I have a crazy irrational fear of feta, but you make it look safe to me! Love watermelon this time of the year, one of the most refreshing treats there is. Thank you so much Pamela! Watermelon is on of my favorites! By the look of your fresh, bright pictures, I never would have guessed it was snowing when you cut up the watermellon. This salad looks so crisp and tasty! I’ve never used watermellon in a salad and I’m going to have to do it soon! Thank you Julia! I am new to the watermelon in the salad thing too, but we loved it! I’ve been trying to resist watermelons at the store, too…but those little ones are so dang cute! I just want to carry one around like a fruit-baby…which, I realize is super weird. 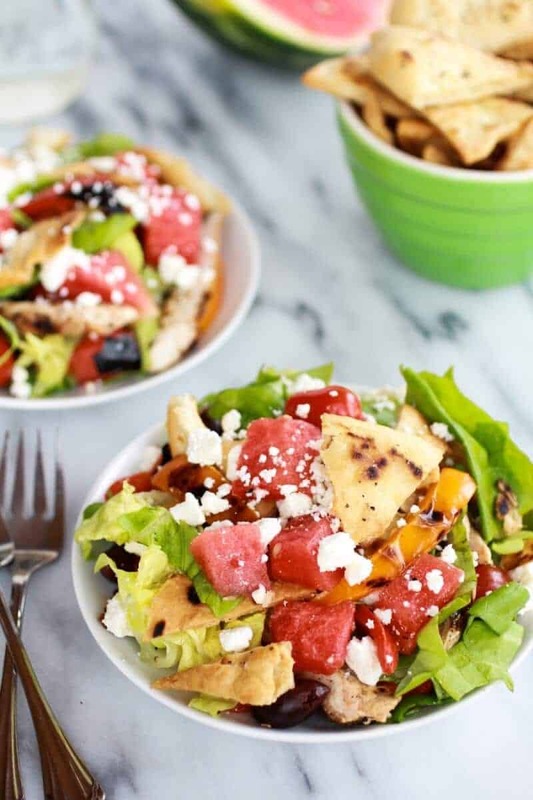 This salad looks so good and refreshing…plus, pita chips FTW! Haha! Fruit-baby! That is awesome! Thanks Cindy! I am so excited to see your comment! 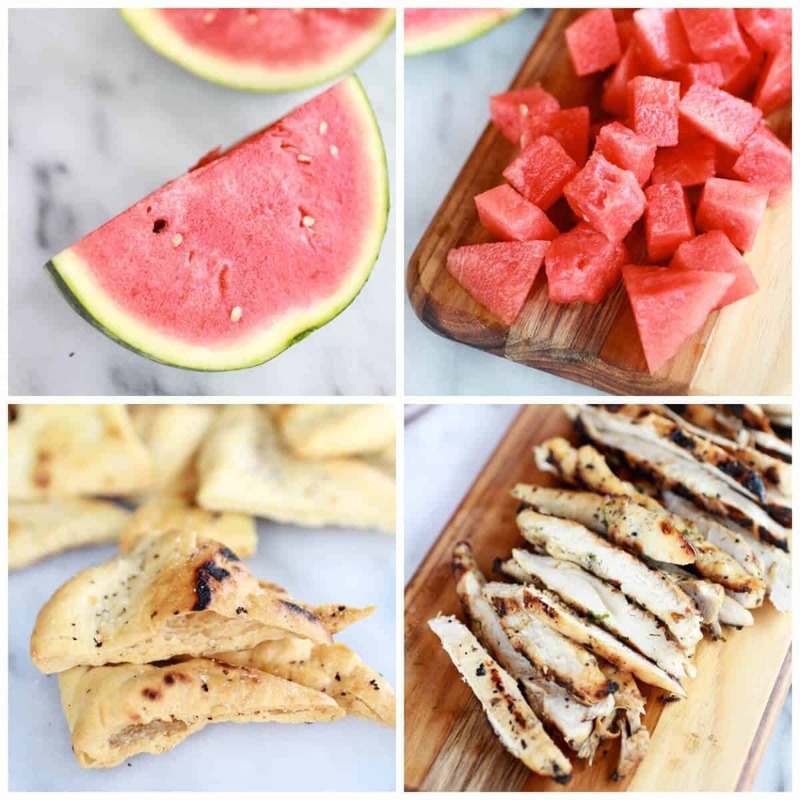 I am intrigued by watermelon in recipes like this! This is the summer I finally try one on my own. 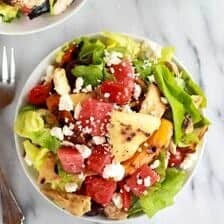 This salad looks so delicious and healthy! Oh man, bummer about last summer! Hope you find a really good one this year! 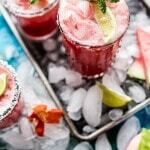 I can not wait to see what watermelon recipes you come up with the summer! I am sure they will be delicious! I just want to have this salad spoon-fed to me daily. YUM! Ha! If only you still live in Colorado! This salad is gorgeous! I love watermelon anything and after reading this I want to go buy one now! YES! That was my goal with this post! Thanks Faith, hope you got get some watermelon soon! Thank you! I am loving all the summer produce these days! Please come live with me. You’ll have free rent if you make me yumminess like this on the daily. I LOVE pita chips and Greek food. 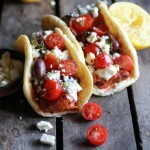 Those chicken gyros look bawwwwwmb! Beautiful! 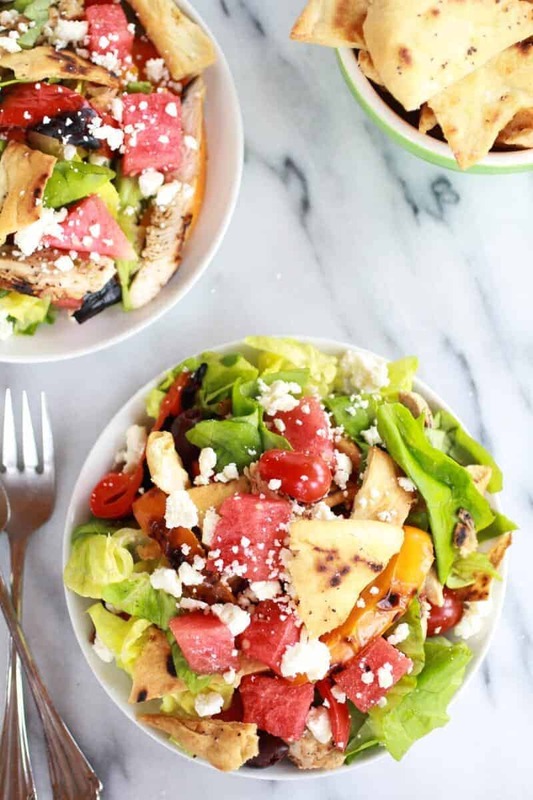 This salad screams summer! These homemade pita chips sound fabulous!! I guess I never realized how easy they are to make at home. Thanks for sharing :). They really are so easy! Thanks Hannah! 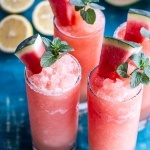 Love watermelon so this looks fab! Thank you, Tina! I love watermelon too! I like to keep my fruits separate too. I would totally try this one out. Glad I am not alone! Thanks so much Meagan! This sounds SO perfect for all this hot weather lately! 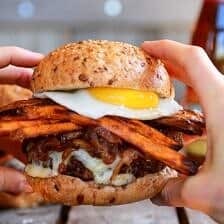 I love finding new lunch inspiration recipes! Wow! Thank so much Jessica!! Happy to inspire! My mouth is watering! And those pita chips…you go girl! HA! I would probably do the very same thing, but the watermelon is on the salad. Either way I hope you give the salad a try! Thanks Mimi! 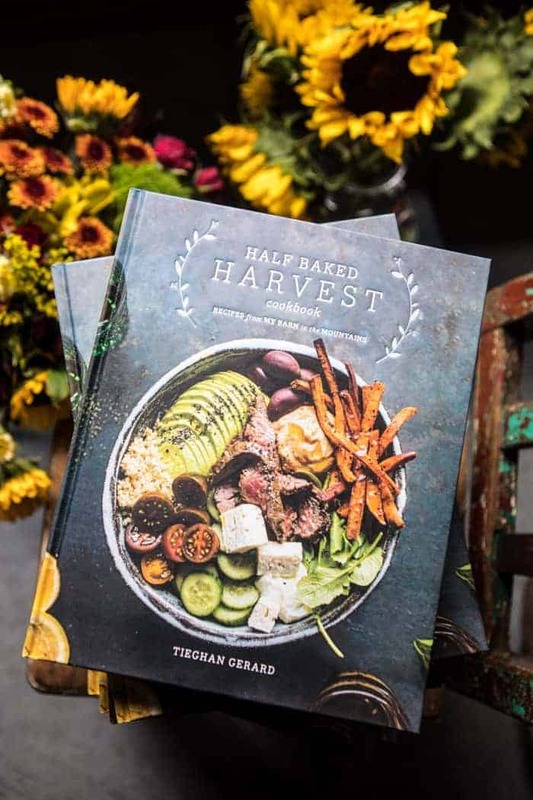 Looks good, Tieghan! Nice and fresh! Gorgeous salad! I love the crunch from those pita chips! Thank you, Julie! The pita chips are so good! This looks delicious! Do you deliver? Ha! If you live in Colorado, then yes! 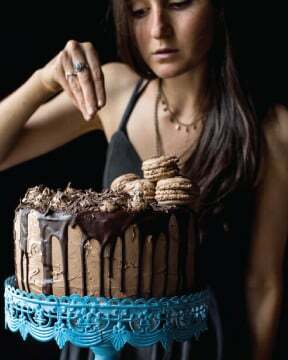 This just looks ridiculously delicious!!! 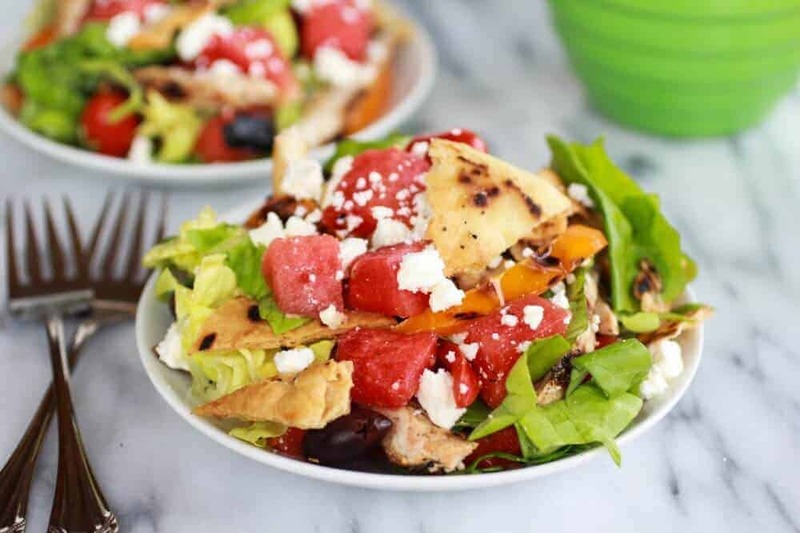 Wow….I love watermelon and feta so much but I have never tried them together! On my list now! !Hopping over form Chef in Training party.Thanks for sharing! Ya! Thank so much for stoping by and I hope you love this salad! Watermelon and feta together are SO good! Ha! Thank you so much, Kristi! 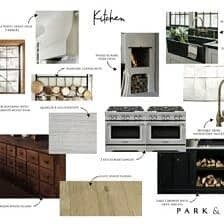 Oh this looks great – the pictures are mouthwatering! This looks awfully refreshing!!! Visiting from Time to Sparkle! Thank you and thank so much for clicking over! Stopping by from Your Creative Timeout Party. I just love watermelon and feta! Thank you so much for stopping by Debra! What a nice combination of flavours! Yup, the RSS feed should do it! If there is a problem let know. Thanks! Actually…our idea of cold, sweet watermelon (or cold, sweet, crisp grapes) with feta cheese is with plain, fresh baked bread, and a cold glass of water…nothing else is required. ?